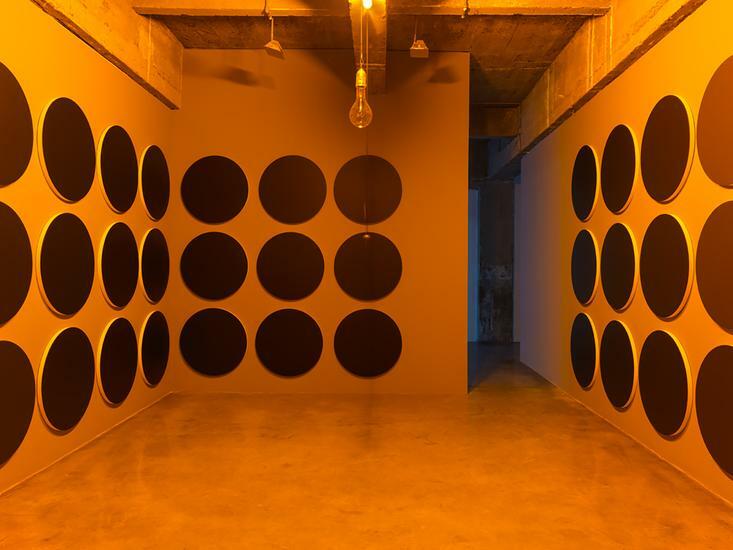 Tanya Bonakdar Gallery is very pleased to announce its ninth solo exhibition with world-renowned artist Olafur Eliasson, The listening dimension, on view March 23 through April 22, 2017. 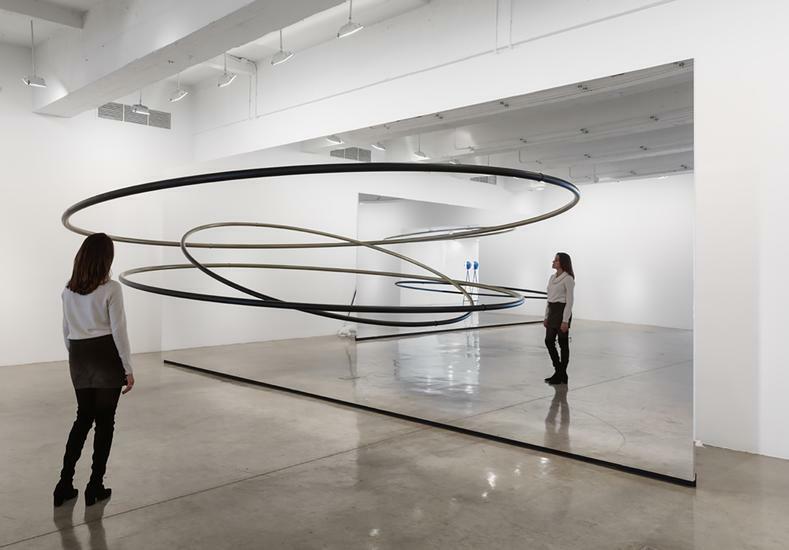 Over the past two decades, Eliasson has developed an immensely rich, curious and complex practice at the intersection of aesthetics, science and ecology. 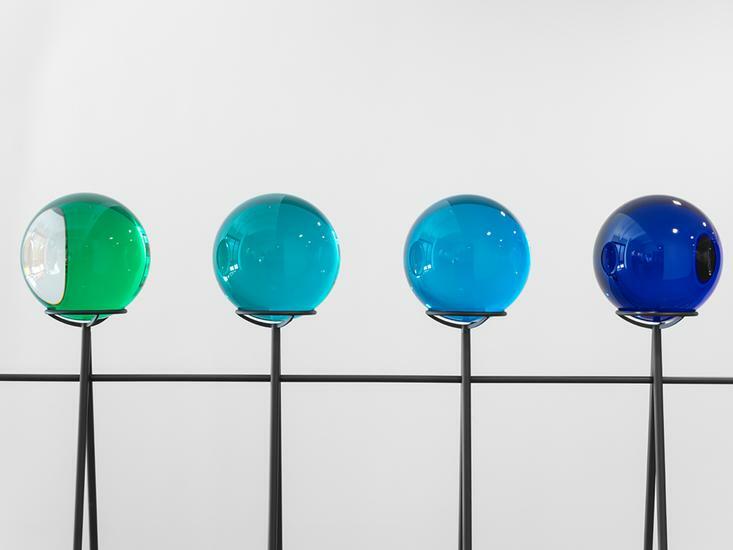 In his first solo presentation in New York since 2012, Eliasson will transform the gallery’s exhibition space, across both floors, with a new body of work that explores light, vision and movement, heightening the viewer’s perceptual awareness and encouraging self-reflection. 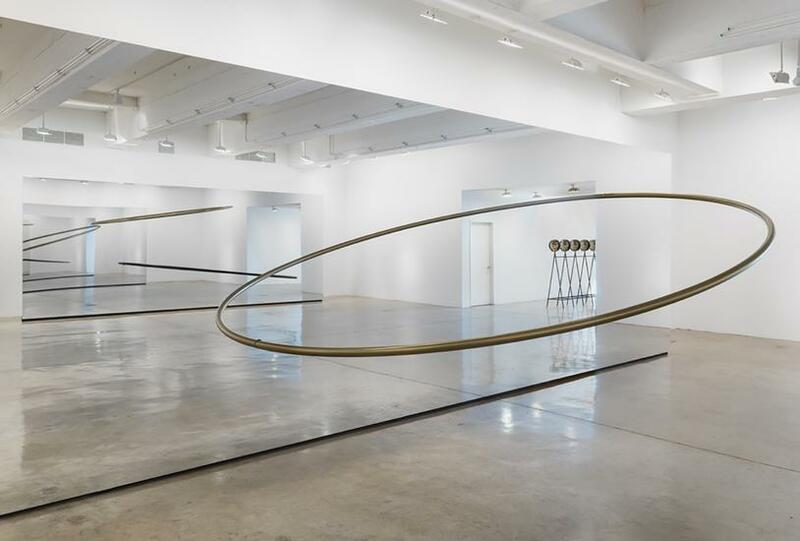 The works in this exhibition depend upon the viewers to co-produce the aesthetic experience, as they are only wholly perceivable when one moves around them. 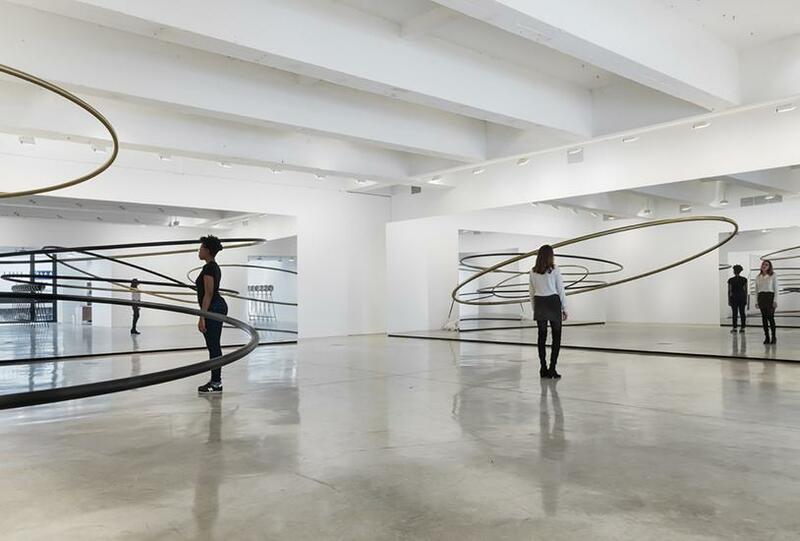 Thus they call our attention to the ways in which we interpret the world. 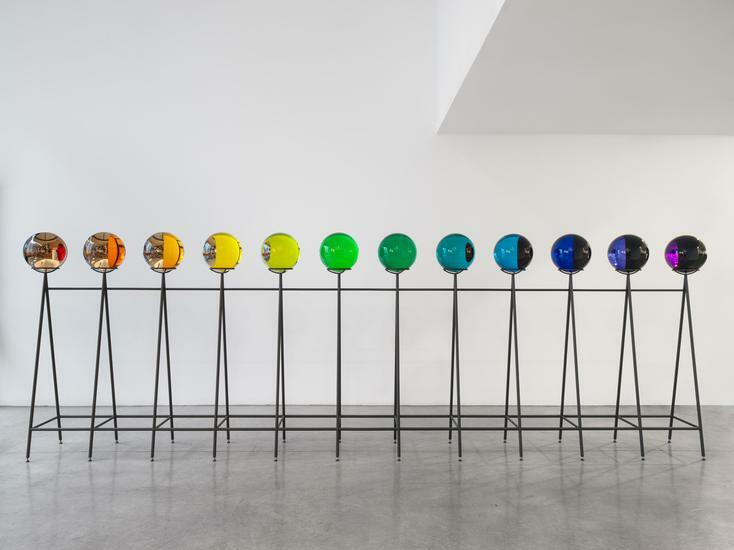 Upon entering the gallery foyer the viewer encounters Rainbow bridge (2017), a series of crystal spheres placed on a steel structure in a range of colors that shift and change as she progresses past and around the sculpture. 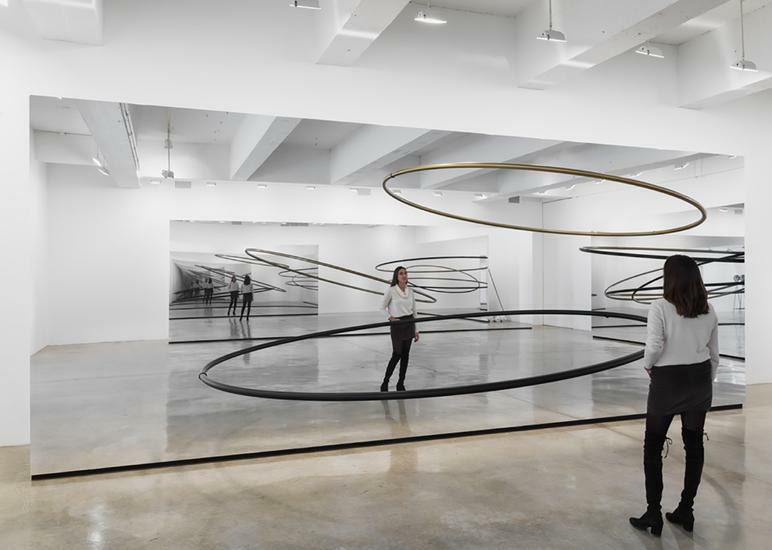 In the main gallery space, an expansive installation presents vast mirror surfaces and curving forms that immerse the viewer in a disorienting environment. 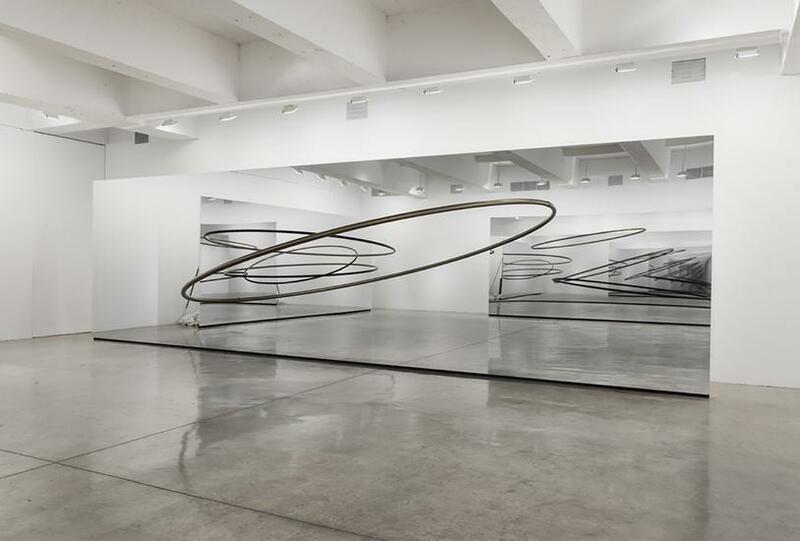 On each wall, one to three large rings appear to hover in space. 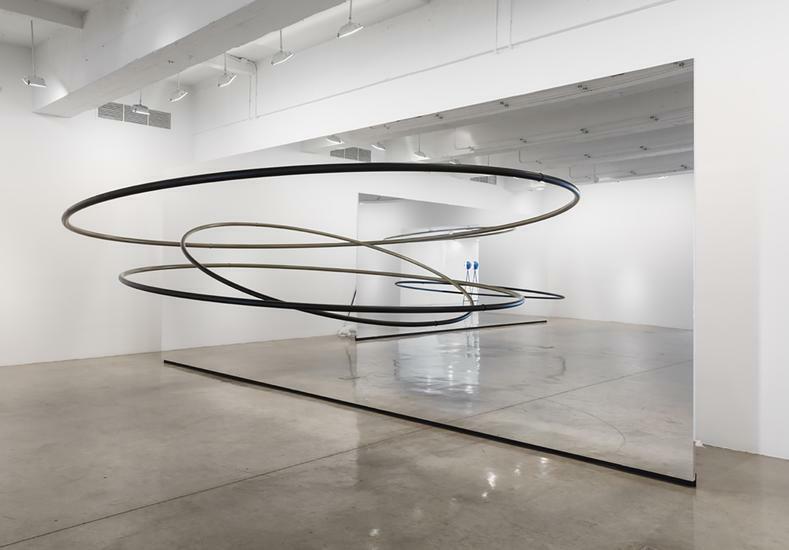 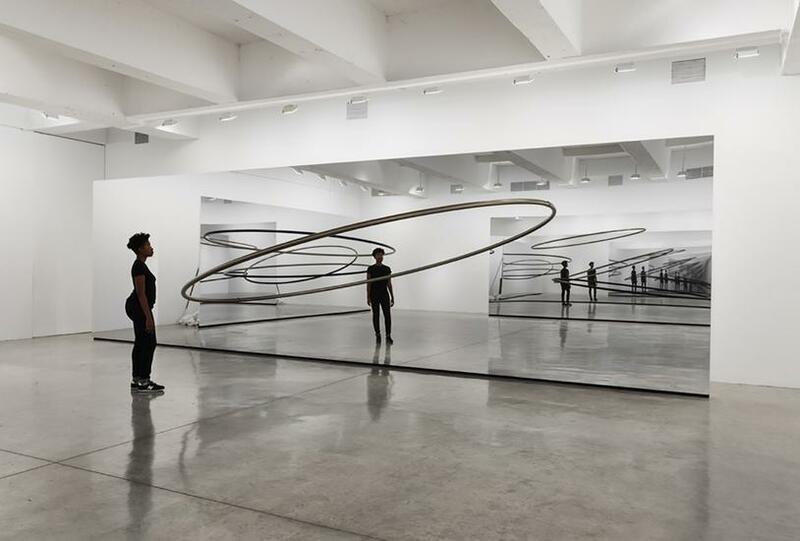 As the viewer moves around the room, the construction is revealed and the rings disclose themselves as semicircular tubes mounted to a mirror. 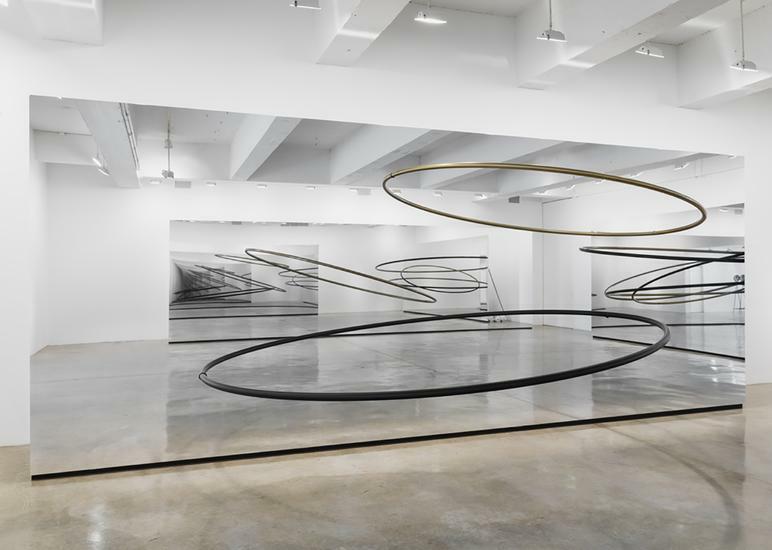 Completed by their reflections, the semi-circular elements produce virtual rings that traverse the boundary between actual and reflected space. 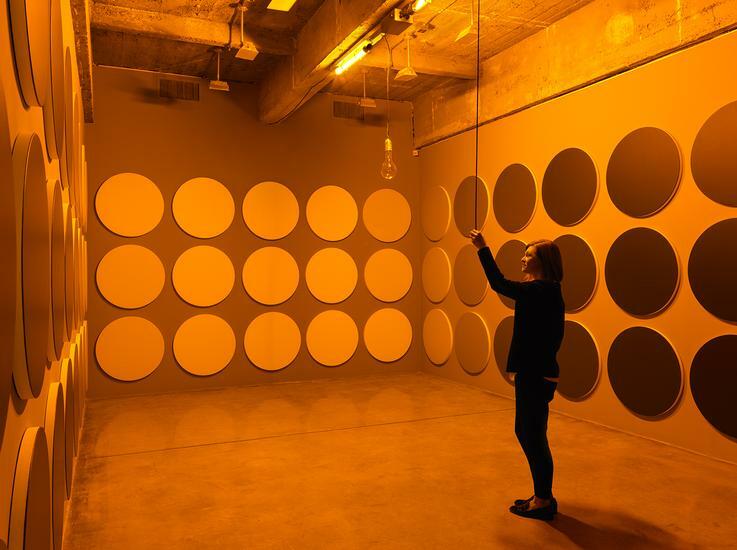 Titled The listening dimension (orbit 1, orbit 2, and orbit 3) (2017), the installation reinforces Eliasson’s insistence on actively engaging the viewer in the artwork. The exhibition continues on the gallery’s second floor with sculptures, installations and paintings that weave together the major themes of Eliasson’s decades-long practice. 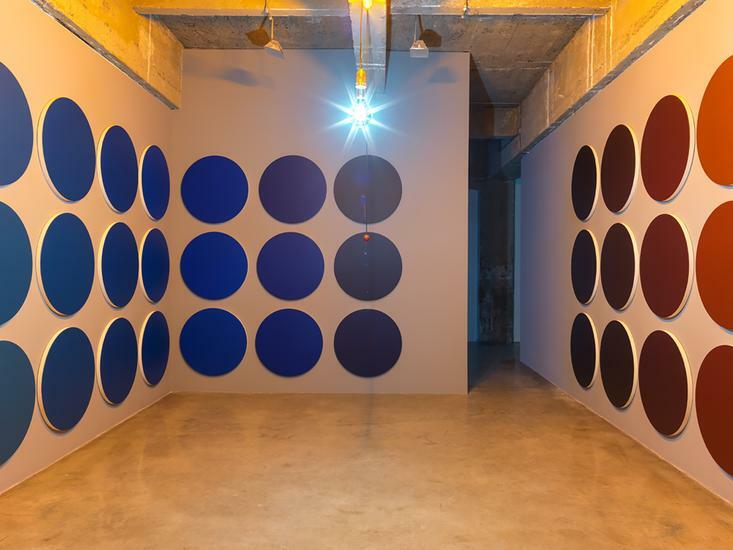 The evocative Space resonates regardless of our presence series from 2017 presents concentric bands of delicately modulated light and shadow, cast on the walls of a darkened room. 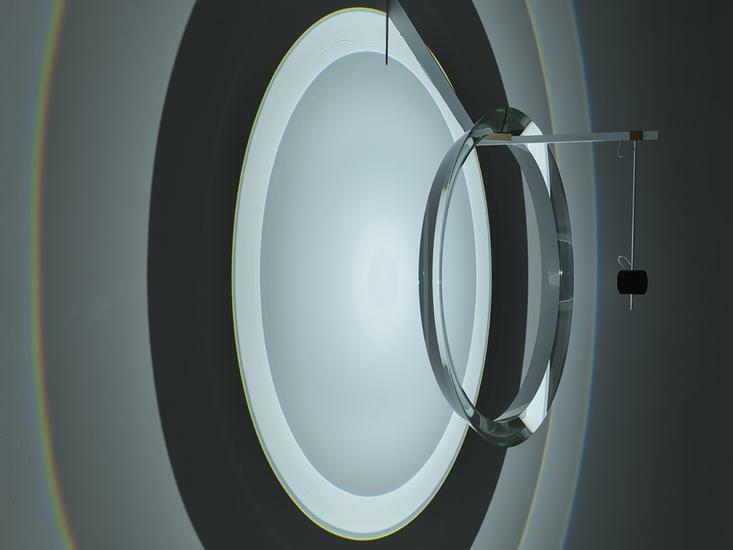 The optical instrument employs a section from a glass lens originally designed for use in lighthouses. 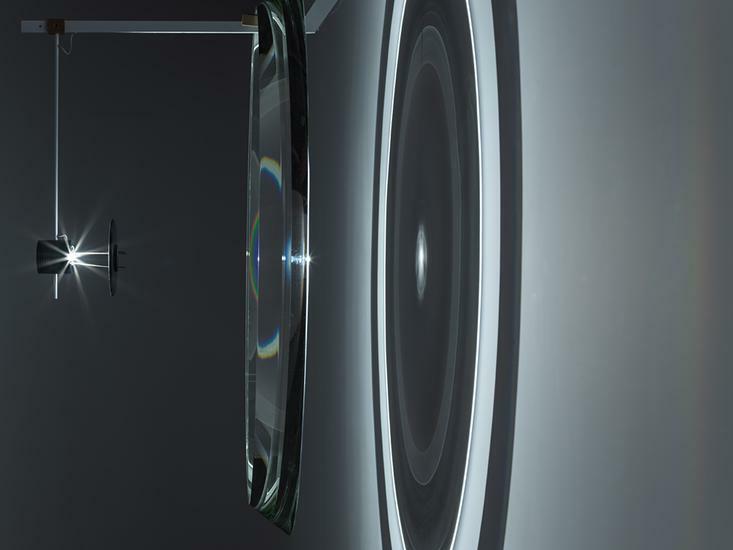 This lens gathers stray beams of light and casts them at a consistent angle, thus enhancing the visibility of the light at sea. 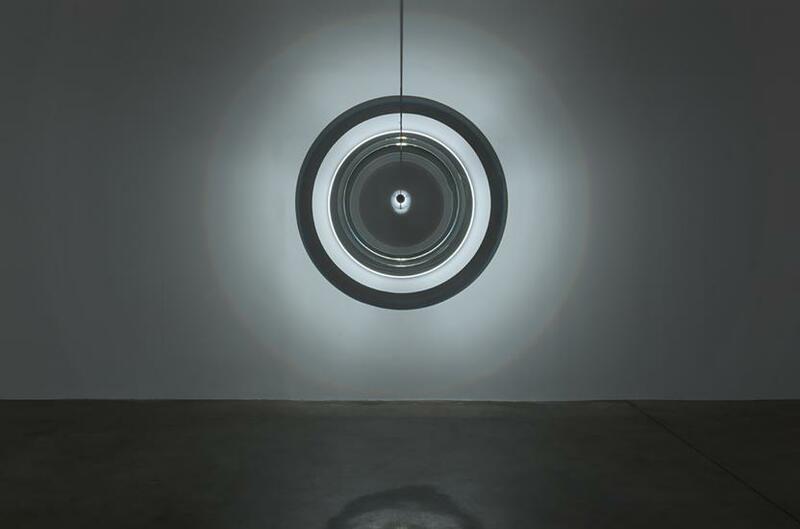 Here the effect of this lens exploits light’s potential as a malleable material. 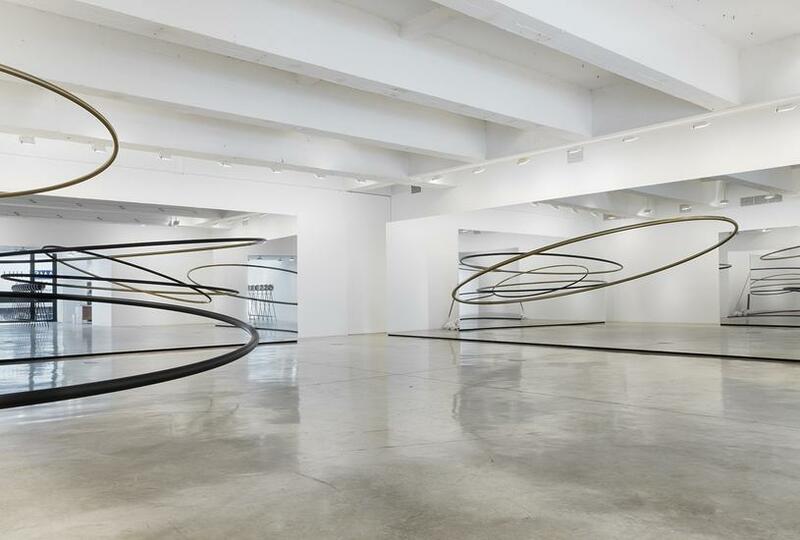 Also on view on this floor is Midnight sun (2017). 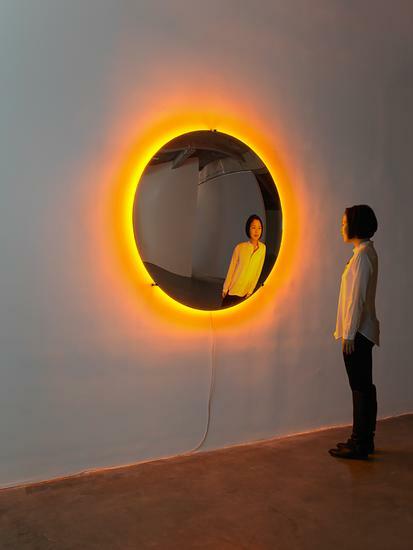 A circular, slightly concave mirror is mounted on the wall; a mono-frequency lamp installed between the mirror and the wall shines into the surrounding room, forming a halo around the reflected space. 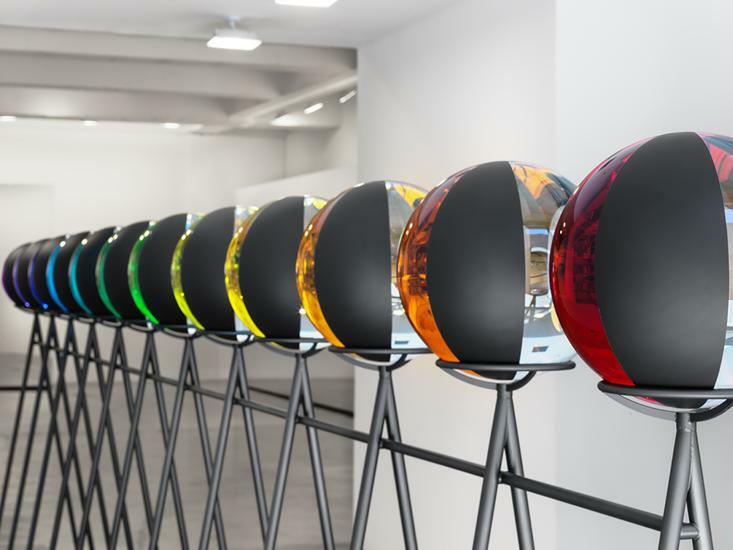 The smooth surface and brilliant color create the impression of a parallel space in which the viewer’s image is mirrored and slightly distorted. 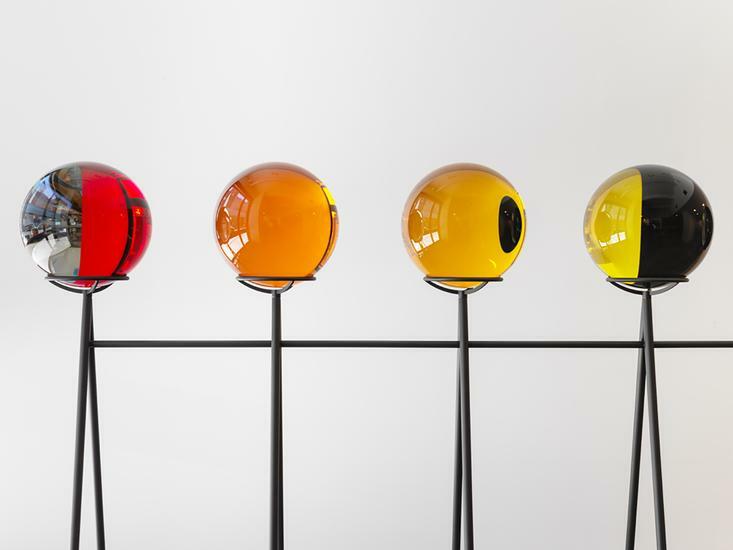 Notions of perception and visual understanding are also addressed in Colour experiment no. 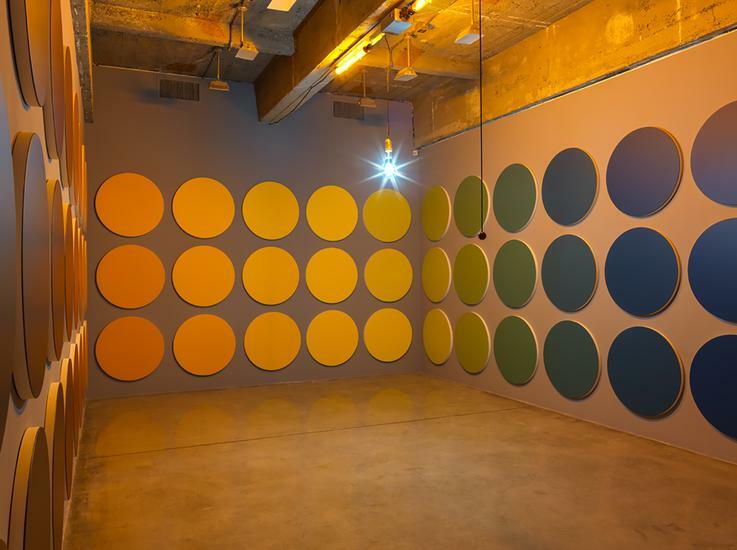 78 (2015), a large grid of seventy-two paintings of subtly progressing hues that reveal the entire spectrum of colors visible to the human eye. 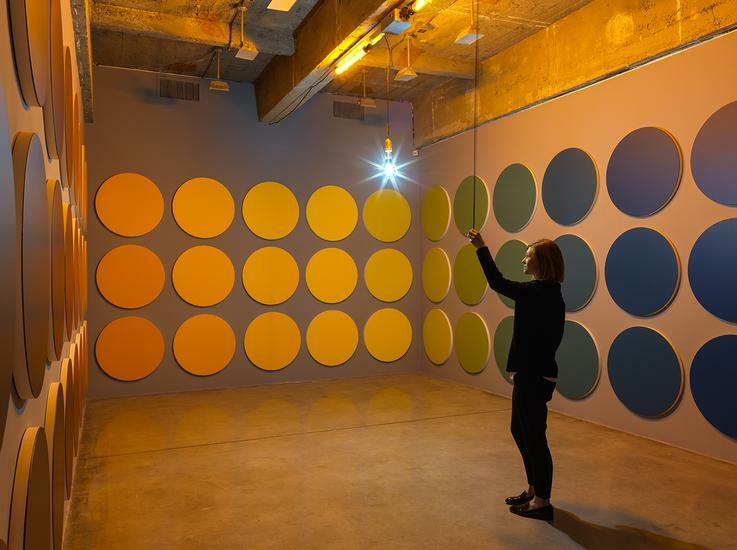 This work is the result of Eliasson’s ongoing research into color phenomena, a process that began by working with a color chemist to create colors that match each nanometer of light in the visible spectrum. 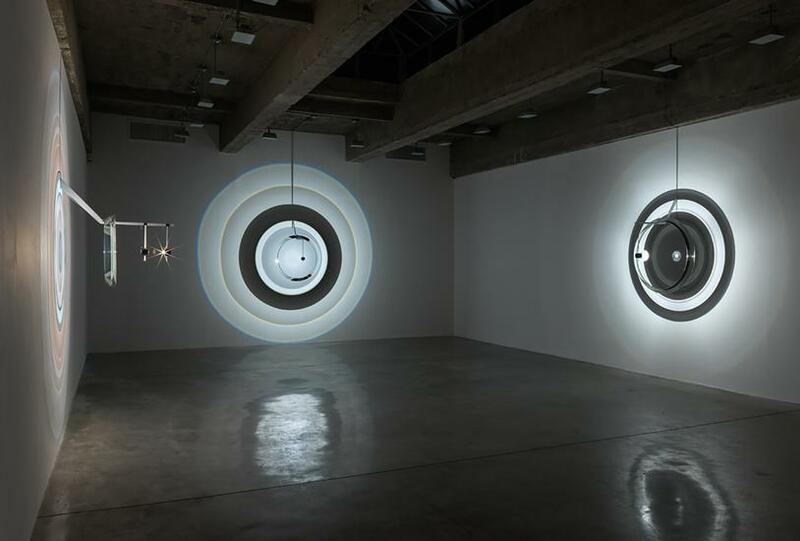 Between the two floors, a large driftwood compass, Rouge navigator (2017), serves as a key to the show. 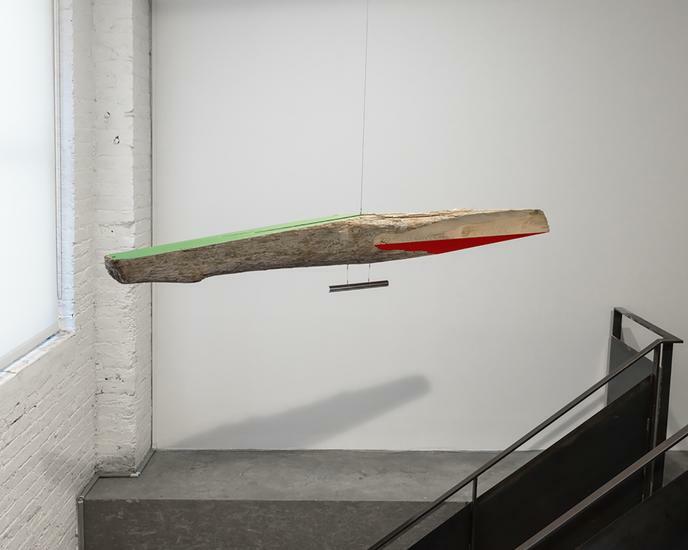 A weathered log painted green and red at each end hangs from the ceiling by a steel wire; a magnetic rod suspended from the driftwood orients the red half towards the north, like the needle of a compass. 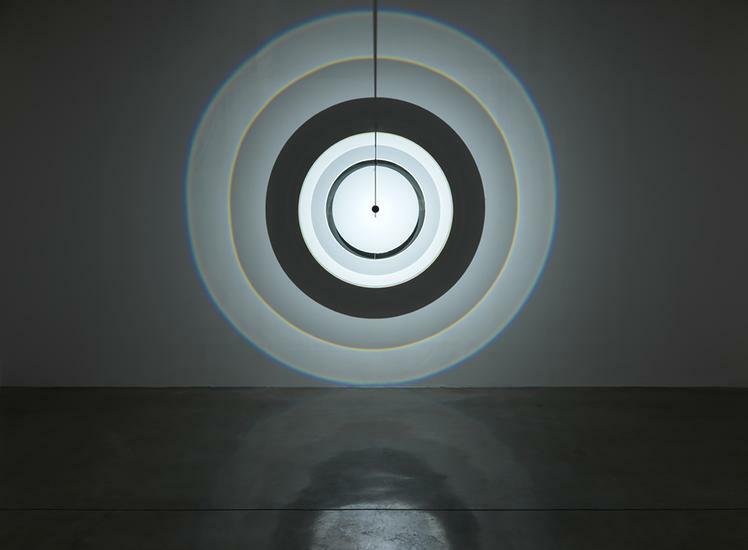 Eliasson’s interest in the compass springs from the way that the instrument, by allowing us to situate ourselves in relation to a map or a grid, enables us to see ourselves within a broader context; a compass refers to a frame of reference beyond our specific location and immediate perception. 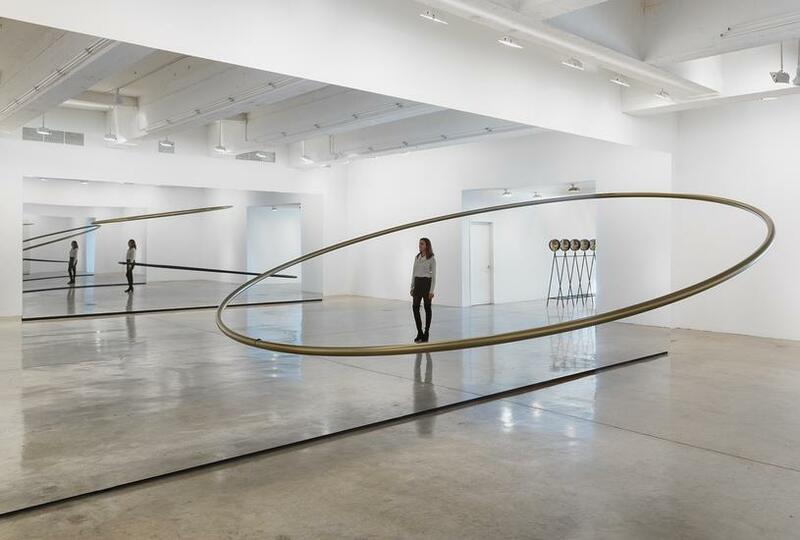 Compasses orient us not only geographically and topographically, but also socially. 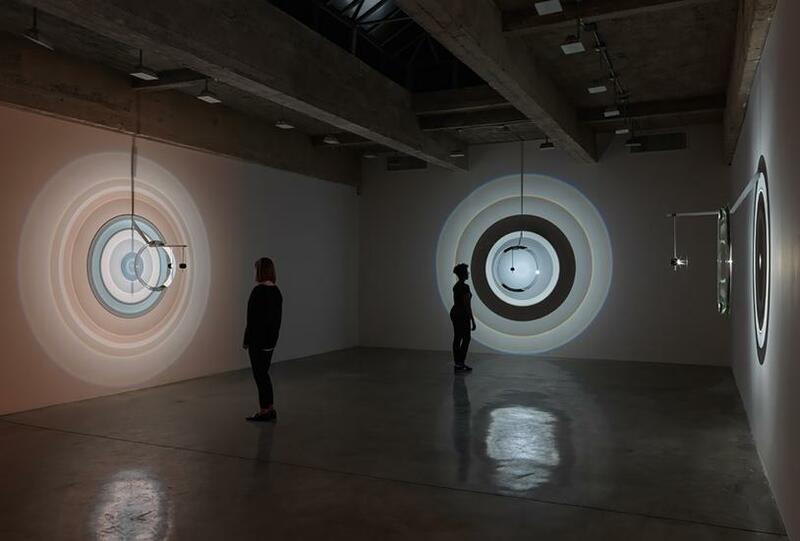 The experience of the compass pointing north is the same everywhere for everyone, and, as Eliasson points out, the universality of this experience of direction is something that connects us. 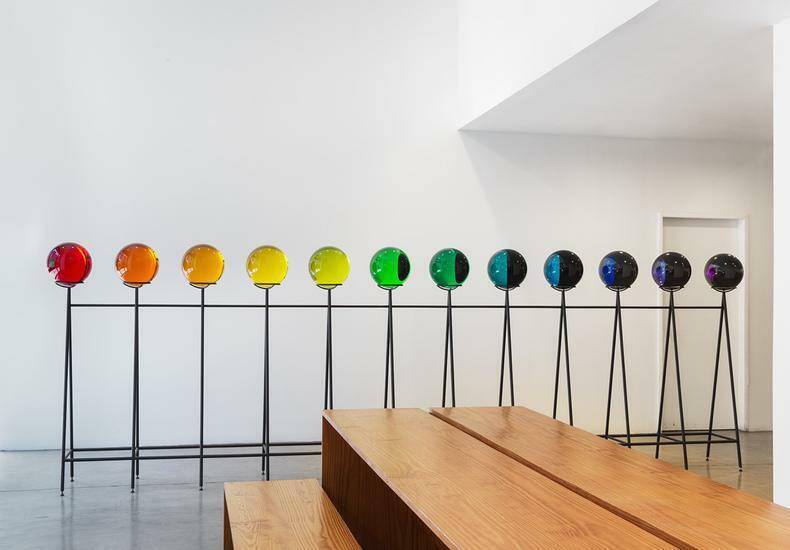 Olafur Eliasson was born in Copenhagen in 1967 and grew up in both Iceland and Denmark. 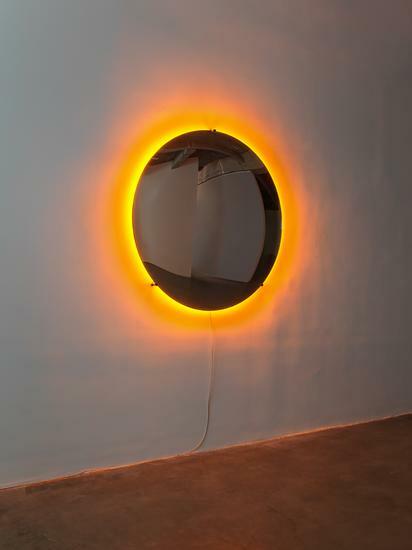 He now lives and works in Copenhagen and Berlin. 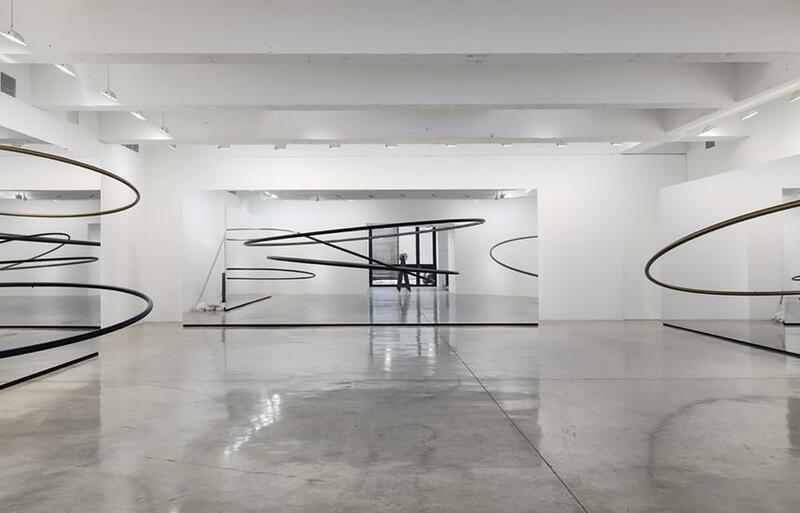 His work is represented in many prestigious collections worldwide, including those of the Museum of Modern Art, New York; Carnegie Museum of Art, Pittsburgh; The Art Institute of Chicago, Chicago; The Solomon Guggenheim Museum, New York; Astrup Fearnley Museum of Modern Art, Oslo; Hirshhorn Museum and Sculpture Garden, Washington D.C.; Leeum Samsung Museum of Art, Seoul, South Korea; Louisiana Museum of Modern Art, Humlebæk, Denmark; MIT List Visual Arts Center, Cambridge, Massachusetts; The Museum of Contemporary Art, Chicago; and the Walker Art Center, Minneapolis. 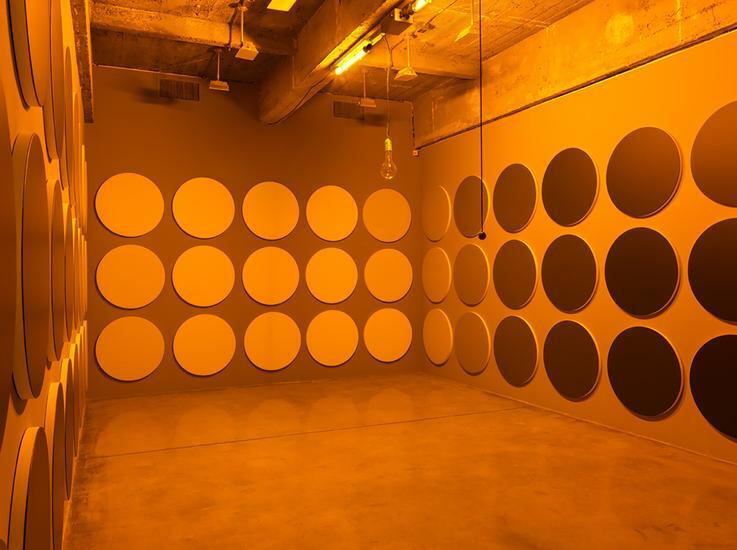 He has also been granted numerous awards, including the Eugene McDermott Award in the Arts at MIT (2014), the Wolf Prize in Painting and Sculpture (2014), the European Union Prize for Contemporary Architecture - Mies van der Rohe Award 2013 (with Henning Larsen Architects and Batterid), the Joan Miró Prize (2007), and the 3rd Benesse Prize (1999).